We are very pleased to announce the dates and location of PCI’s 2019 Annual Meeting -- The Sonesta Resort on Hilton Head Island will play host to our meeting in June. All the events and education you have come to enjoy from a PCI annual meeting will be back. But we are also pleased to announce that we will again co-located alongside the Chemical Coaters Association International's Annual Meeting. PCI will have several PCI events on our own (optional social activity; committee meetings, business meetings) and we’ll have several events held in conjunction with CCAI (welcome reception, joint general sessions, joint golf outing). 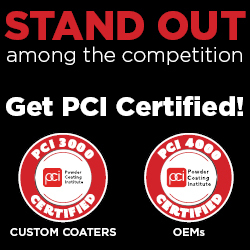 You may choose to attend only the PCI meeting or both the PCI and CCAI Annual Meeting. If you are registering for BOTH the CCAI & PCI Annual Meeting you MUST use the Joint Registration Form to receive the discount registration fee.